Event will include music, memories & fun! 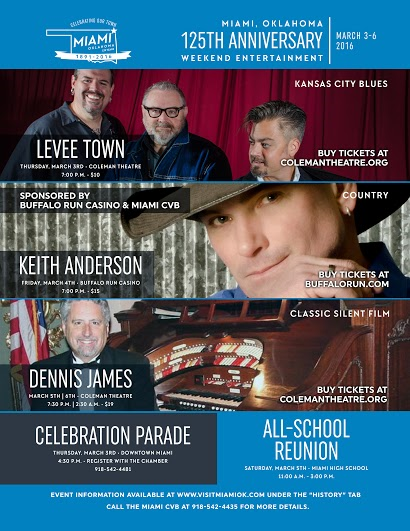 Follow the Miami OK 125th Anniversary Celebration Facebook Page for updates. Call the Miami CVB at 918-542-4435 for more details. Thank you to the following sponsors for Miami's 125th Anniversary Celebration. Miami Area Economic Development Service, Inc.
Ottawa County Abstract & Title Co.
Susan Rhodes Real Estate Co.